Sun-warmed surfaces. The comfortable feel of worn-smooth wood. Imagine enjoying these with virtually no maintenance. We invite you to experience the new Natural Finishes Collection. Plants and Things USA combines the beauty of natural wood with all the benefits of recycled plastic poly lumber. With a raised grain surface and the color going all the way thru the poly lumber furniture it will give you the feel and look of real wood without the staining and painting. Hard to wear out but easy to enjoy furniture. This chair is available in two tone combination only. The combination are antique mahogany/black frame, antique mahogany/green frame, antique mahogany/white frame, driftwood gray/white frame and driftwood gray/black frame. 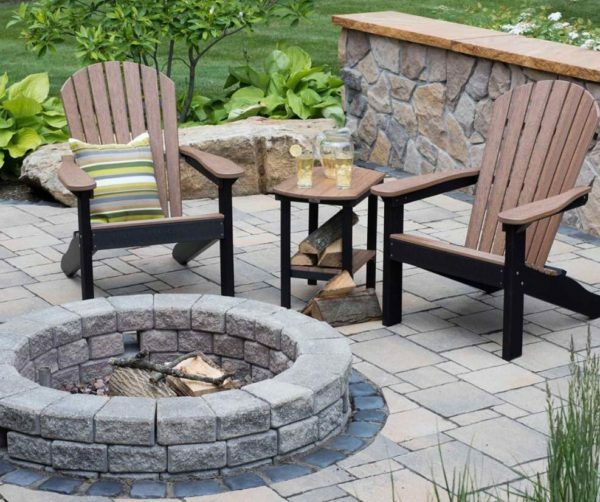 Just like all of our Adirondack chairs, this chair sits 2″ higher in the front leg for easy in and out.